The Personal Ordinariate of the Chair of Saint Peter is a personal ordinariate of the Catholic Church—a jurisdiction within the Church, the equivalent of a diocese, for priests and laypeople from an Anglican background, that enables them to retain elements of their Anglican patrimony after entering the Catholic Church. Its territory extends over the United States and Canada. Former Methodists and former members of denominations such as the United Church of Canada are also included, as they are considered members of "ecclesial communion[s]" of "Anglican heritage". The ordinariate describes itself as "a structure, similar to a diocese, that was created by the Vatican in 2012 for former Anglican communities and clergy seeking to become Catholic. Once Catholic, the communities retain many aspects of their Anglican heritage, liturgy, and traditions". It has also been described as "a special kind of diocese confined to specific national territory - much like a military ordinariate that serves members of a national armed forces". The ordinariate uses a missal called Divine Worship: The Missal, a variation of the Roman Rite officially referred to as the "Divine Worship or Ordinariate Use", which incorporates aspects of the Anglican liturgical tradition. 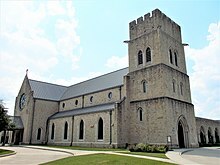 Based in Houston, Texas, with the Cathedral of Our Lady of Walsingham as its principal church, the ordinariate includes 44 parishes throughout the United States and Canada. Originally, its territory was the same as that of the United States Conference of Catholic Bishops . However, it was announced on 7 December 2012 that the Holy See, after consulting the Canadian Conference of Catholic Bishops, had extended its territory to include Canada also. Accordingly, the head of the ordinariate is a full member of both episcopal conferences. The second personal ordinariate to be established after the promulgation of Anglicanorum coetibus, the Personal Ordinariate of the Chair of Saint Peter is, according to the decree of its erection, juridically equivalent to a diocese. The faithful of the ordinariate are led by an ordinary who is named directly by the pope. The ordinary may be a bishop, if celibate, or priest, if married. Initially, the Holy See named all married ordinaries as apostolic protonotaries – that is, monsignori of the highest rank – soon after the respective appointments to that office. In the case of an ordinary who is an apostolic protonotary, the ordinary holds the same power of governance over the ordinariate that a diocesan bishop holds over a diocese. The only practical difference is that a bishop may ordain clergy for the ordinariate personally, whereas an ordinary who is not a bishop must ask a bishop to ordain clergy of the ordinariate on his behalf in the same manner as the major superior of a clerical religious order. In 2016, the Personal Ordinariate of the Chair of Saint Peter became the first personal ordinariate to receive a bishop as its ordinary when Steven J. Lopes was installed. The ordinary of a personal ordinariate is the equivalent to a diocesan bishop, and thus wears the same ecclesiastical attire and uses the same pontifical insignia (mitre, crosier, pectoral cross, and episcopal ring) as a diocesan bishop, even if he is not a bishop. The ordinary is also, ex officio, a full member of the episcopal conference(s) of the territory of the ordinariate. From the reign of Pope Pius XII if not before, popes have granted dispensations from the norm of celibacy for the ordination of married former Protestant and Anglican clergy in the Catholic Church – but the numbers were generally small so the Vatican processed those cases individually. The situation changed in the late 1970s when hundreds of former clergy of the Episcopal Church (TEC), including several who brought their congregations with them, sought ordination in the Catholic Church and, in the case of those who brought congregations with them, provision of liturgical books that followed their Anglican tradition. Pope John Paul II responded to this situation, first, by establishing a "Pastoral Provision" to facilitate processing of the large number of requests for dispensations coming from former TEC clergy the United States in 1980 and, second, by authorizing the Book of Divine Worship based on the Anglican Book of Common Prayer for use by intact communities of former Anglicans, which variously became parishes, missions, or chaplaincies of the local Roman Catholic diocese. The Vatican also prescribed the use of the Revised Standard Version, Second Catholic Edition translation of biblical texts, rather than the New American Bible translation then in use in the United States, in conjunction with the rites of the Book of Divine Worship. The Book of Divine Worship was officially deemed to be an interim work, authorized ad experimentum pending completion of a final edition, but there was no further work on "approved liturgical books of the Anglican tradition" in the decades that followed. In the first decade of the 21st century, a number of bishops from the Church of England and the bishops of the Traditional Anglican Communion (TAC), a global "continuing Anglican" body, independently approached the Vatican seeking some manner of corporate reunion that would preserve their autonomy and their ecclesial structure within the Catholic Church. Pope Benedict XVI promulgated the apostolic constitution Anglicanorum coetibus, permitting erection of personal ordinariates equivalent to dioceses, on 4 November 2009. Pursuant to Anglicanorum coetibus, the Holy See subsequently erected three ordinariates within the next three years in countries where interest among prospective Anglican clergy and communities was strongest: 1) the Personal Ordinariate of Our Lady of Walsingham in the territory of the episcopal conference of England and Wales on 15 January 2011, 2) the Personal Ordinariate of the Chair of Saint Peter in the territory of the United States Conference of Catholic Bishops on 1 January 2012, and 3) the Personal Ordinariate of Our Lady of the Southern Cross in the territory of Australian Conference of Catholic Bishops on 15 June 2012. The decree erecting the Personal Ordinariate of the Chair of St. Peter designated the Cathedral of Our Lady of Walsingham in Houston as the principal church of the ordinariate, analogous to the cathedral church of a diocese. This church was home to one of the congregations that came into the church under the Pope John Paul II's Pastoral Provision of 1980, effectively transferring that parish from the Diocese of Galveston-Houston to the ordinariate. On the same day, Pope Benedict XVI appointed Jeffrey N. Steenson, who had served as Bishop of the Rio Grande of the Episcopal Church prior to his reception into full communion and ordination in the Catholic Church, as its first ordinary. Steenson was installed as ordinary on 12 February 2012 during a Mass celebrated at the Co-Cathedral of the Sacred Heart in Houston led by cardinals Daniel DiNardo and Donald Wuerl. In the first weeks after the erection of the ordinariate, over 100 Anglican clergy applied to be Catholic priests in the ordinariate, and over 1,400 lay people joined. Within the first year of the ordinariate's existence, the number of communities joining the ordinariate quickly grew to nearly three dozen. As of the spring of 2017, there are 43 parishes or canonical communities within the ordinariate. Mount Calvary Church in Baltimore voted to join the ordinariate in 2010. In December 2011, the parish had settled in court with the Episcopal Diocese of Maryland over the church and associated properties. Thus, on 21 January 2012, Mount Calvary parish was received together as the first ordinariate parish in North America. On 26 June 2012, Randy Sly, a former archbishop in the Charismatic Episcopal Church, was ordained to the priesthood by Bishop Paul Loverde in Potomac Falls. On 16 September 2012, the Cathedral of the Incarnation, the cathedral of the Diocese of Eastern United States of the Anglican Church in America, was received into the ordinariate along with their bishop, Louis Campese. After the reception of several Anglican communities in Canada, the ordinariate formed a deanery for Canada, the Deanery of Saint John the Baptist, on 7 December 2012. 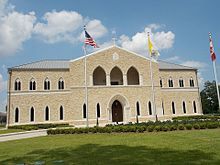 On February 4, 2015, the ordinariate dedicated a new chancery building, on property adjacent to its principal church (which would become its cathedral with the installation of its first bishop in 2016), Our Lady of Walsingham, in Houston. The chancery complex includes offices for the Bishop and his staff, conference rooms and gathering areas, a Great Hall, as well as meeting rooms. Cardinal William Levada, Prefect Emeritus of the Congregation for the Doctrine of the Faith, officiated at the dedication, accompanied by Cardinal Daniel DiNardo, archbishop of the Roman Catholic Archdiocese of Galveston–Houston and Cardinal DiNardo’s predecessor, Archbishop Joseph Fiorenza. On 24 November 2015, Pope Francis appointed Steven J. Lopes the first bishop of the personal ordinariate. It was announced that on 2 February 2016 that he would succeed Steenson. This appointment was the first time a bishop has been named to any of the world's three personal ordinariates for former Anglicans. With the appointment of a bishop to head the ordinariate, the principal church was elevated to a cathedral, the third in Houston. In 2017, the ordinariate inducted the last of the Anglican Use parishes originally erected under the provisions of the 1980 Pastoral Provision with the decree, on March 21, by the Holy See that "all parishes of the Pastoral Provision are to be incorporated into the Ordinariate." With this decree, Our Lady of the Atonement in San Antonio – the first and also largest of the Pastoral Provision parishes – became a parish of the ordinariate, along with its clergy. Our Lady of the Atonement also brought with it the ordinariate's first K–12 Catholic school, The Atonement Academy, with over five hundred students enrolled. The other remaining Pastoral Provision parish, the Congregation of St. Athanasius in Boston, is also expected to join the ordinariate pursuant to the Holy See's decree. Upon erection of the first ordinariates, the Vatican established the commission Anglicanae Traditiones to prepare liturgical books of the Anglican tradition for their use, and also for use of the communities of former Anglicans who remain under the jurisdiction of their local dioceses. This commission, under the direction of Steven Lopes, first published Divine Worship: Occasional Services containing rites for baptisms, weddings, and funerals, followed by Divine Worship: The Missal containing the rite for Mass to replace the respective rites in the Book of Divine Worship. The ordinariate missal took effect on the first Sunday of Advent (27 November) in 2015. Lopes, who was in Houston following the announcement of his appointment as the new ordinary, was the principal celebrant of the first Mass at the ordinariate's principal church according to the new missal. The new rites retain the use of the Revised Standard Version, Second Catholic Edition translation of scriptural texts. The apostolic constitution Anglicanorum coetibus drew significant interest in Canada, but the number of communities were too few to support a separate ordinariate for that country. Thus, Cardinal Thomas Collins, Archbishop of Toronto, approached Jeffrey N. Steenson to work out a solution that would extend the Ordinariate of the Chair of St. Peter into Canada. While all of this was pending, the parish of St. John the Evangelist in Calgary, Alberta, formerly of the Anglican Church in Canada (ACC), came into the full communion of the Catholic Church with its priest, Lee Kenyon, in December 2011, initially as a parish of the Diocese of Calgary with faculties to celebrate the liturgy according to the Book of Divine Worship. On 15 April 2012, former bishops Peter Wilkinson and Carl Reid of the Anglican Catholic Church of Canada (ACCC), the Canadian province of the Traditional Anglican Communion (TAC), and their congregations also came into the full communion of the Catholic Church. In April 2012, Steenson had expressed his agreement with the idea that all groups of Canadian Anglicans who had taken or would in the future take the step of joining the Catholic Church should be organized as parishes of a deanery of the Ordinariate of the Chair of Saint Peter. On 7 December 2012, the ordinariate formally erected the Deanery of Saint John the Baptist for the Canadian parishes and the ordinary appointed Kenyon as its first dean, with the approval of the Holy See and the support of the Canadian Conference of Catholic Bishops. The name, first proposed by then-ACCC bishop Peter Wilkinson, is that of a patron saint of Canada whose feast was significant in the discovery of Canada by both the English and the French. On 8 December 2012, the day after the announcement of the extension of the Personal Ordinariate of the Chair of Saint Peter to Canada, Peter Wilkinson, the former Metropolitan Bishop of Canada of the Anglican Catholic Church of Canada (ACCC), was ordained to the priesthood in the Catholic Church by Bishop Richard Gagnon [de] at St. Andrew's Cathedral in Victoria. Wilkinson was later named a Prelate of Honor by Pope Benedict XVI. On 26 January 2013, Carl Reid, a former ACCC bishop, was ordained by Archbishop Terrence Prendergast at the Notre-Dame Cathedral Basilica in Ottawa. The Deanery of St. John the Baptist now encompasses 11 communities from New Brunswick to British Columbia. The liturgical calendar of the ordinariate was approved by the Congregation for Divine Worship and the Discipline of the Sacraments in early 2012. In the main, it is identical with the two current Roman Rite liturgical calendars for the dioceses of the United States and Canada, but it has retained some elements that form part of the Anglican patrimony. In place of "Sundays in Ordinary Time", it uses the expressions "Sundays after Epiphany", "Sundays before Lent" (with the names "Septuagesima", "Sexagesima" and "Quinquagesima" in parentheses), and "Sundays after Trinity". However, the readings at Mass are identical with those in the Roman Rite Lectionary. Ember Days are observed on the Wednesday, Friday, and Saturday after the First Sunday of Lent, Pentecost, Holy Cross Day and Saint Lucy's Day. Rogation Days are observed on the three days before Ascension Thursday. In the week between Pentecost and Trinity Sunday, elements of the former octave are fostered: while the readings of the Ordinary Time weekday are retained, the Mass propers and use of red as the liturgical color "may sustain the themes of Pentecost." Jeffrey N. Steenson – a married former Episcopal bishop who joined the Catholic Church in 2007, becoming a Catholic priest in 2009. He developed the education and training program for Anglican priests who wish to join the Catholic Church. ^ "How To Join the Ordinariate". Archived from the original on 2015-03-11. Retrieved March 7, 2018. ^ a b "Ordinariate Questions & Answers". ^ "Mt. Calvary Catholic Church". www.mountcalvary.com. Retrieved 2018-03-15. ^ "Ordinariate unveils new Mass text that draws on Cranmer". Catholic Herald. London , England, UK. 11 October 2013. Retrieved 29 June 2016. ^ a b c d e f Barned-Smith, St. John; Turner, Allan (24 November 2015). "From Houston, new bishop will reach out across the nation". The Houston Chronicle. Retrieved 27 November 2015. ^ a b Congregation for the Doctrine of the Faith (1 January 2012). "Decree of Erection of the Personal Ordinariate of the Chair of Saint Peter". Holy See. ^ a b "Canadian Conference of Catholic Bishops". ^ a b c d Patel, Purva (12 Feb 2012). "Cardinals install Catholic convert in rarefied post". Houston Chronicle. Retrieved 13 February 2012. ^ Ceremonial of Bishops, Congregation for Divine Worship, 14 September 1984, No. 1206. ^ a b c "Anglicans have U.S. home in Catholic church". USAToday. AP. ^ "Parish Finder". ordinariate.net. Retrieved 2017-07-19. ^ Sutton, Eugene Taylor (21 January 2012). "One spiritual family living in two houses". Baltimore Sun. Retrieved 27 May 2016. ^ "Area Man Transitions from Anglican Archbishop to Catholic Priest". Leesburg Today. Retrieved 8 March 2013. ^ "American Anglican bishop goes to Rome, brings cathedral congregation with him". Virtue Online. Retrieved 8 March 2013. ^ STAFF, ORDINARIATE (4 February 2015). "New Chancery dedicated and blessed". Personal Ordinariate of the Chair of St. Peter. Personal Ordinariate of the Chair of St. Peter. Retrieved 22 March 2017. ^ a b c d SMITH, PETER JESSERER (25 November 2015). "Historic Day for Catholics of Anglican Heritage as Pope Francis Names First Ordinariate Bishop". National Catholic Register. EWTN News, Inc. Retrieved 27 May 2016. ^ FABER, JENNY (21 March 2017). "Becoming One". Personal Ordinariate of the Chair of St. Peter. POCSP. Retrieved 22 March 2017. ^ "Canadian Anglican Bishops Received Into Church". ZENIT - The World Seen From Rome. Archived from the original on 2012-04-22. ^ "Former Anglican Archbishop is Happy to be a Catholic parish priest". s-National Catholic Register. Retrieved 10 December 2012. ^ "Former Anglican Archbishop ordained as Catholic priest". s-The B.C. Catholic Peper. Archived from the original on 4 March 2016. Retrieved 26 January 2013. ^ "Liturgical Calendar for the Ordinariate of the Chair of Saint Peter" (PDF). "Media Backgrounder" (PDF). United States Conference of Catholic Bishops. February 2013. Retrieved 7 May 2016. Miller, Duane Alexander (September 2011). "Anglicanorum Coetibus and the Church of Our Lady of the Atonement, the Founding Parish of Anglican Use in the Roman Catholic Church". Anglican and Episcopal History. 80 (3): 296–305. Retrieved 26 March 2017. Wikimedia Commons has media related to Personal Ordinariate of the Chair of Saint Peter. "Personal Ordinariate of the Chair of Saint Peter". Catholic-Hierarchy.org. David M. Cheney. Retrieved 1 January 2012.